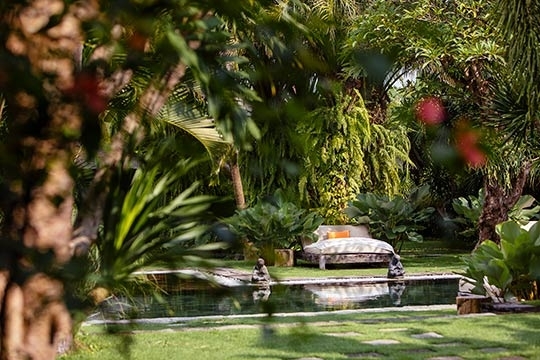 An enchanting 5-bedroomed villa where historic charm blends seamlessly with contemporary luxury and fabulous service to create an unforgettable experience. 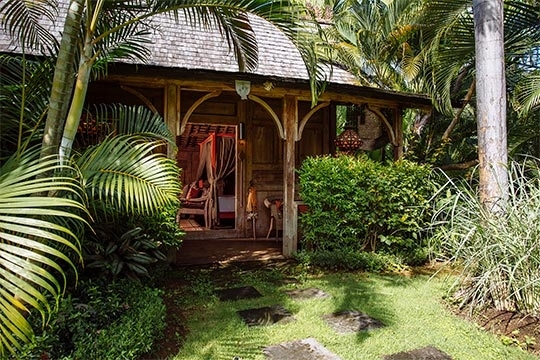 Antique-filled, vintage wooden houses make evocative sleeping quarters, while lush tropical gardens fringe a 20m pool, and a sweeping ocean beach is just a short stroll down a quiet lane. 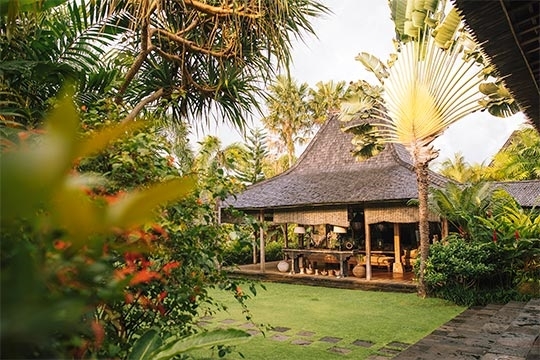 Villa Zelie celebrates old-world Indonesia, evoking a sense of magic and wonder with its collection of beautiful joglos and gladak (antique wooden houses) nestled amidst flourishing tropical gardens. 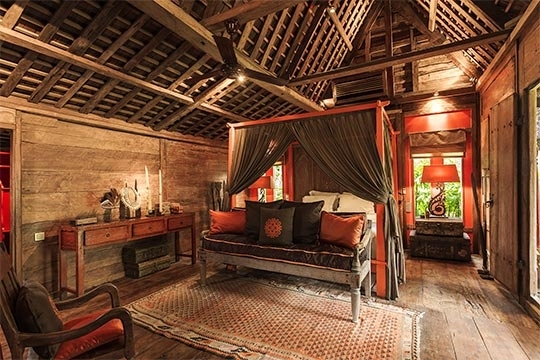 Built of high quality teak, joglos were traditionally the homes of Javanese nobility, with elaborate hand carved doors, central pillars and beams denoting social status. 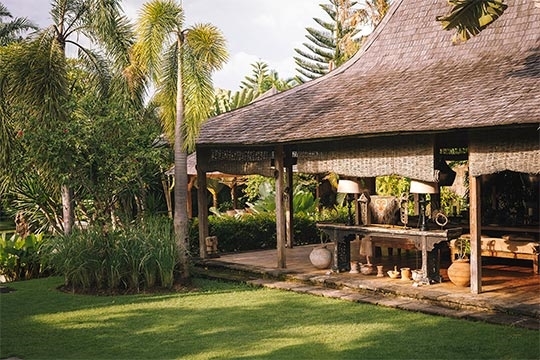 The owner of Villa Zelie, a famous French designer and collector, has scoured the islands to hand pick the vintage houses and the astounding array of antiques that fill them, giving guests a fascinating glimpse into Indonesian history. 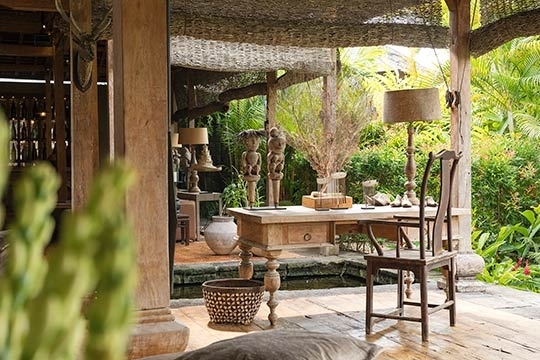 The result combines the serenity and grace of Bali with the old-world charm of Java, and a dash of French flair. 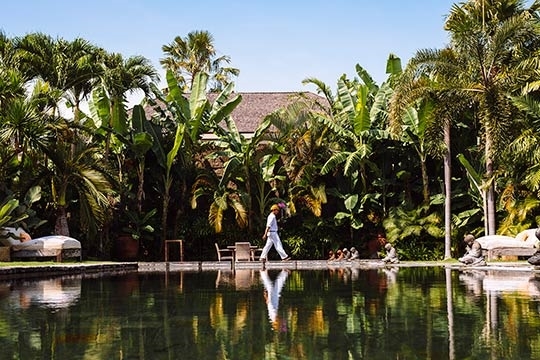 Nine structures are arranged around verdant gardens of water lilies and banana trees, and include open-sided communal areas, and five atmospheric sleeping quarters, each with private terrace and semi-open-air bathroom. 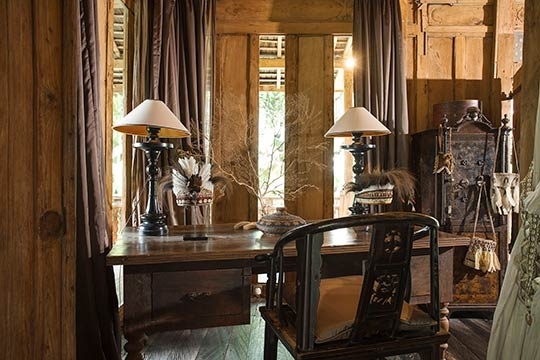 The intricately carved buildings are works of art in themselves, enhanced by richly woven floor mats, embroidered linens, raw silks and hanging lanterns. 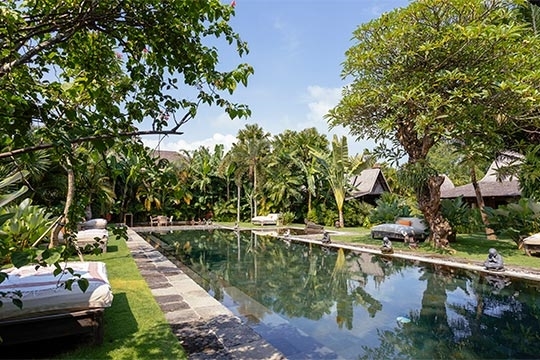 The stunning 20m swimming pool is surrounded by lush velvety lawns and plump cushion-filled daybeds, and has a separate shallow end for children. Ideal for families and groups, Villa Zelie’s generous living spaces feature a banquet-sized dining table, oversized sofas and daybeds and a bar/lounge with drop-down cinema screen. 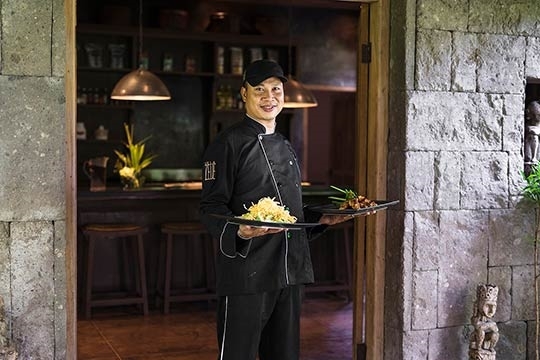 Adding to the palatial experience of the villa, are wonderfully attentive staff dressed in traditional attire. From the moment you arrive ‘til the moment you leave everything will be taken care of with the utmost grace and the sincerest of smiles. Guests are spoiled by two talented chefs spoil you with excellent meals from a suggestion menu (or according to request). A grocery float is requested in advance to cover for ingredients cost which is subject to service charge and government tax or at 20%++. Their lemongrass chicken, handmade ravioli and divine chocolate mousse are highly recommended. The beach is just 100m away, but currents can be strong, so best to walk south towards the flagged beach in Batubelig. 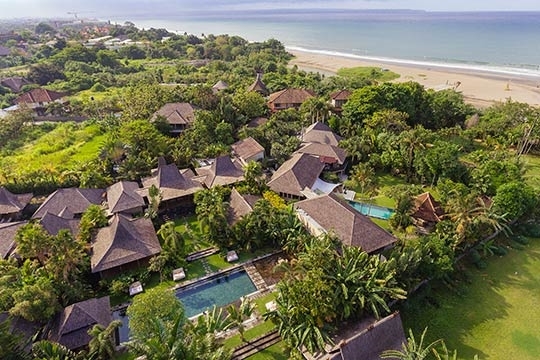 Located in Berawa, the villa is just minutes from Petitenget and Seminyak, with some of the best beach clubs and restaurants a mere 15 minute stroll along the sand. 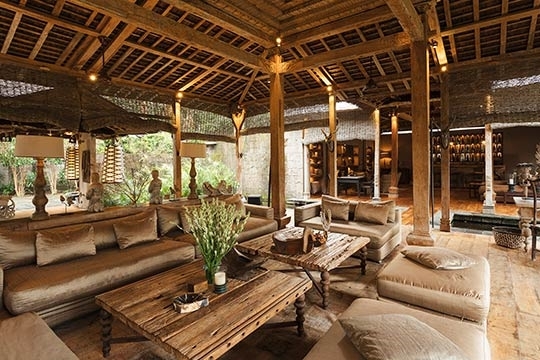 A luxury villa capturing Bali at its most serene and seductive. 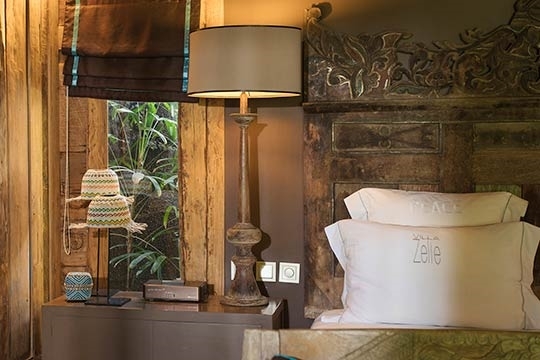 We are no strangers to beautiful villas, but Villa Zelie is definitely one of our favourites, and we were happy to forget the real world as we immersed ourselves in this enchanted cocoon of sumptuous comfort and superlative service. In these days of modern minimalism we relished the chance to bask in pure, unabashed old-world glory. 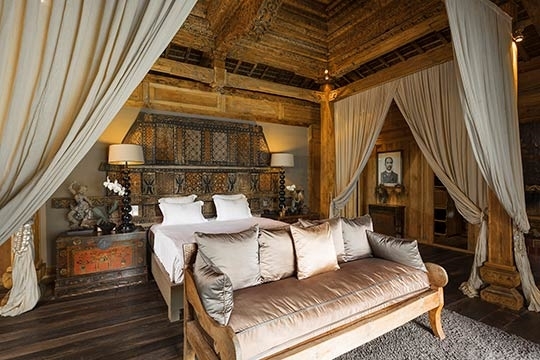 Every glance and every turn was greeted with a slice of Indonesian history; from the delicate floral motifs hand-carved on wood, to tribal shell-encrusted neck pieces fastening back drapes, nightstands adorned with feather headdresses and corners filled with stone statues. 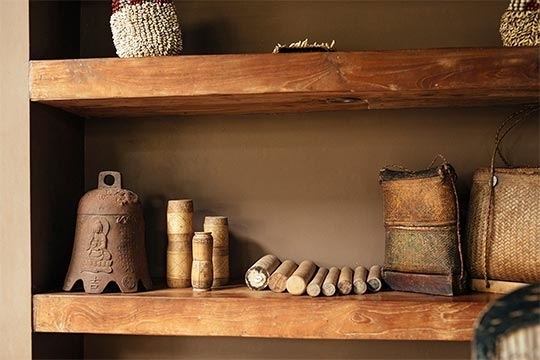 And it wasn’t just the quality of the antiques, but also their thoughtful placement and display, which made it abundantly clear that the owner has impeccable taste and style. 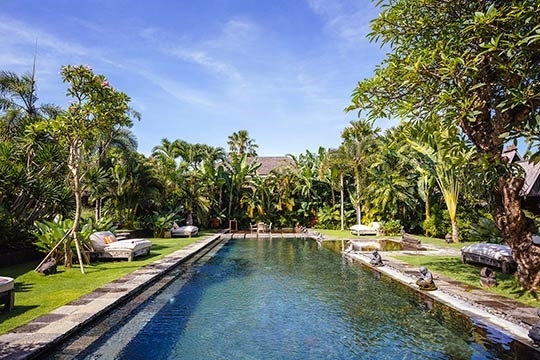 The pool was absolutely stunning, long enough for swimming lengths, and perfectly situated in the middle of the property to soak up 360-degree panoramas of the ornate buildings framed by elegant travellers palms and a deep blue sky. Zelie is more than just a villa; it’s an experience – and one that we never wanted to end! 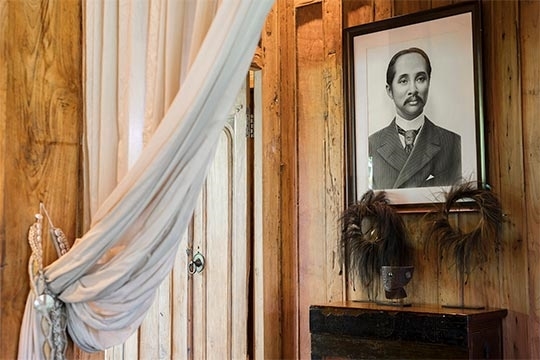 Villa Zelie provides a true feast for the senses; the wonderful feeling of solid teak under foot, soaking in a stone bathtub surrounded by candles, dining like royalty at the banquet table (not to mention being treated like royalty by the staff). Being surrounded by so much beauty was a privilege. 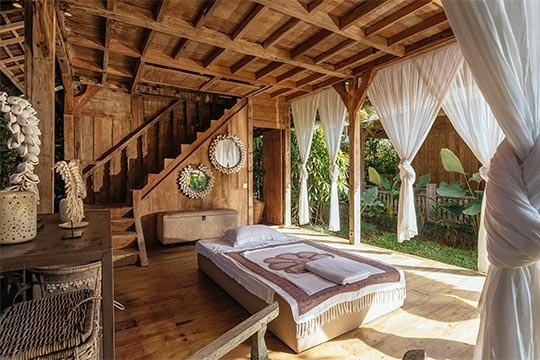 We are clutching at straws here as we absolutely loved this villa, but we did note that only the master bedroom has TV, although with the cinema screen in the lounge and so much natural beauty around us, watching TV in bed was the last thing on our minds. Gracias! That is big thank you in Spain. A wonderful house with amazing staff. We will be back. 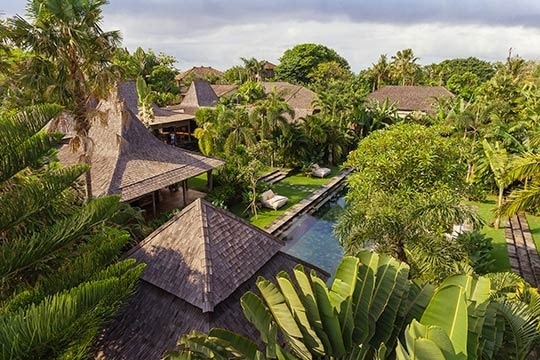 Incredible time at one of the most beautiful villa in Bali. Thanks to all the amazing staff that help made our vacation so memorable. Such an amazing time at one of the most beautiful villas. Wonderful staff with excellent hospitality. Thanks so much for all your hospitality and incredible service. This place is truly amazing. This oasis will be forever in our hearts. Thank you all for the lovely time we spent in Villa Zelie. The staff are great and we enjoyed the food. In time, we will look at the many photo's we took and relive days over here, thank you. We came to Villa Zelie to celebrate my 60th birthday, our 30th wedding anniversary and my recovery from cancer. We flew all of our children here and joined together for a week of fun relaxation and family time. It has been wonderful. Everyone here has been so kind and hospitable and made our week so special. Sincere thanks for making our 17 days stay here so welcoming and enjoyable. With our three children it was important to have a villa where the kids would roam, swim, play and chill out. Our two sets of family friends had just as much fun as we did. However, they only got half the time. 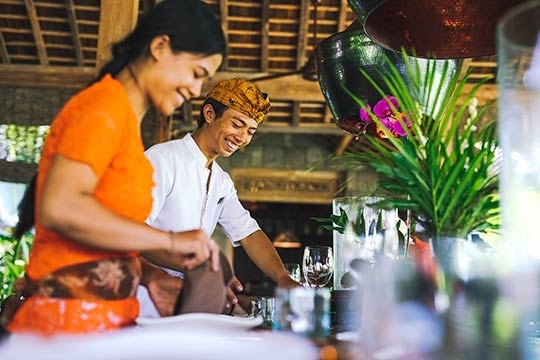 We were absolutely blown away by the constant service, attentiveness and genuine care from Putu and Tapa. The food cooked by Made was consistently good. Our favorites were the steamed banana leaf fish and prawn curry. We are very appreciative of the efforts by the entire team. Villa Zelie is Amazing. Each side of the villa is well decorated, clean, and well maintained. The bed is super comfortable and each rooms are spacious. The garden is well maintained. 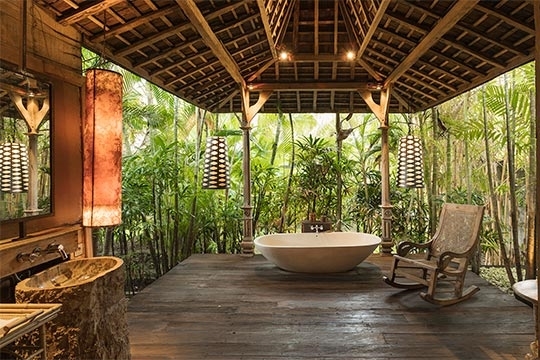 You will really feel the serenity at this villa. It's just so beautiful. The whole team is so welcoming, they are very attentive to all our needs and always give us big smiles. Thank you too to our Chef who made us a delicious omelette this morning. Thank you team for taking good care of us, we have enjoyed our stay so much. 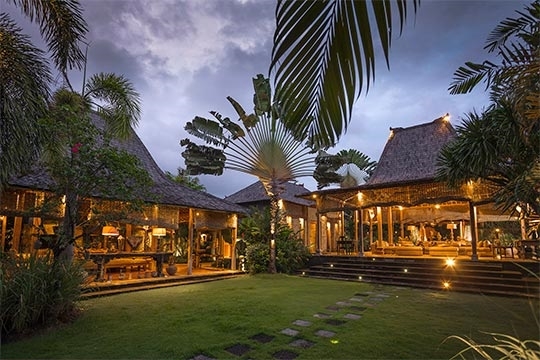 Villa Zelie, this place is haven made in Bali. We spent six days at Villa Zelie. We had big expectations before coming here and I must admit that it was even better. The unique charm of the property, the staff well prepared and always attentive. Next to the beach and perfectly situated. We are able to do everything we planned. Thank you for making our stay delightful - from service, the food, the appetizers and the constant care. Thank you for making our 10 year wedding anniversary so exceptionally magical. We all had such a wonderful time with you. Our beds were so comfortable and we loved soaking in the bathtubs. All the children loved swimming in the pool, with all different levels to jump off. Your family and entrance room became the perfect areas to play games, cards, draw and fill our world cup stickers balls. Movie night was also always a family favorite. Thank you to the exceptional warm, friendly and very responsive team. We loved our stay at Villa Zelie. A very peaceful home for 2 weeks. Everything is possible here. A place where your dreams come true. Best staff in the whole world. Thank you for making this possible. We are forever grateful! 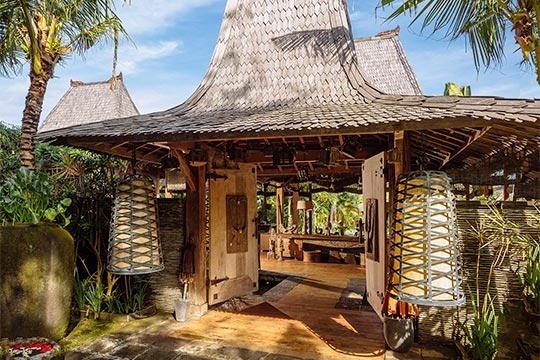 Knew Bali really well but this has been the most comportable, beautiful house that we have stayed in. Chef excellent, staff could not do more to help. Hope to return very soon. We had a wonderful time at Villa Zelie with friends and family. Beautiful decoration, very nice and friendly staff. We'll recommend for sure in Belgium, thank you. A wonderful stay with very attentive and kind staff. We had a fantastic stay. The service staff are all very good and made our stay truly awesome. Thank you very much. Best chef and butlers ever ! Six fabulous days in this beautiful villa! A big thank you to Putu and Tapa for their effective presence while remaining discreet and thank you to the rest of the staff. A wonderful experience, see you soon. Thank you for wonderful stay. Staff are fabulous, we hope to return. Thank you guys for this wonderful stay. That lemon tart was amazing. Please keep up the good vibe. Big shout out to Putu, Tapa and all the staff for making our stay just fantastic. Great atmosphere, great hospitality, we couldn't ask for more. Thank you, terima kasih. Thank you all for the perfect service from all staff, the villa is amazing sure it will not be my last time. 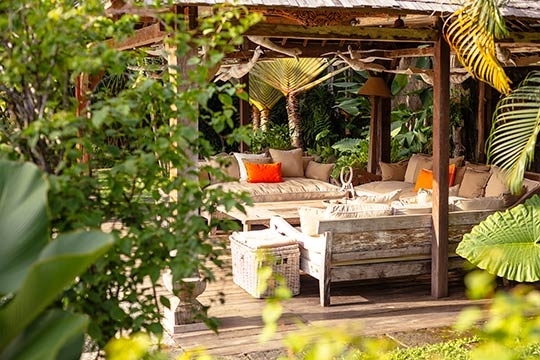 Villa Zelie is situated on a quiet, leafy lane in an area typified by private villas and traditional rice fields. A bamboo hanging bridge 100m from the villa crosses a lagoon and leads onto Kayuh Putih beach. As currents can be strong on this section of the coast, it’s best to walk south towards Batubelig beach (500m) and swim between the yellow flags. 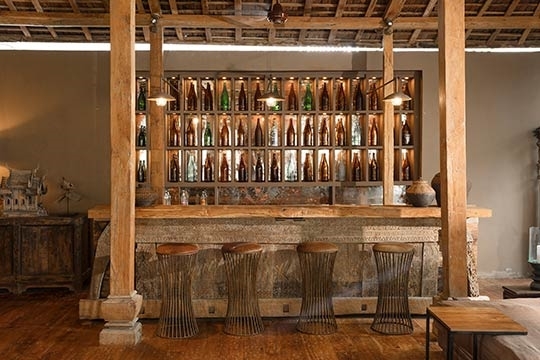 The chill-out La Laguna beach bar and restaurant is a two-minute walk from the villa and further down the beach are Potato Head Beach Club, and the W Resort and Spa – two of the most happening spots in Bali. 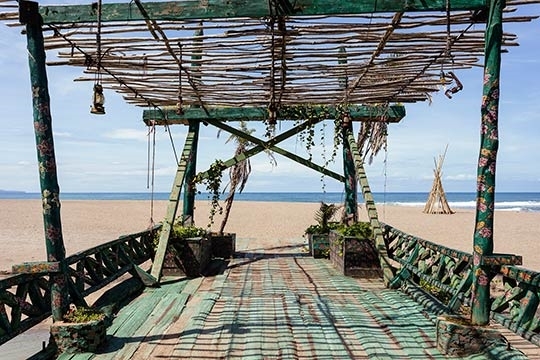 Along the beach to the north is Finns Beach Club, and the many shops, restaurants and bars of Canggu and Seminyak are within a short drive of the villa. 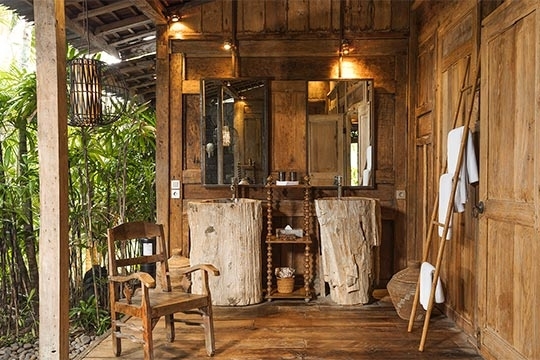 Entering through the colossal wooden doors of Villa Zelie is like stepping back in time. Four open-sided, fan-cooled teak pavilions, linked by covered walkways over fishponds, make up the villa’s communal areas. 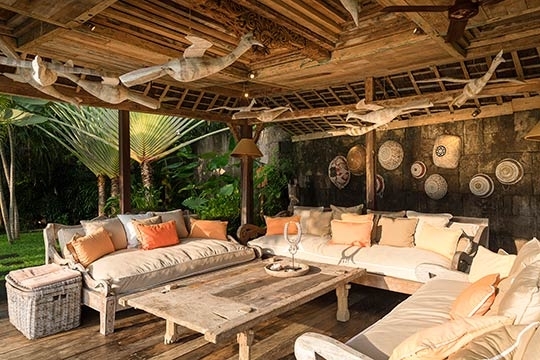 The main lounge is set in a stunning, intricately carved, open-sided joglo overlooking the pool and gardens, furnished with immense sofas covered in raw silk and arranged around heavy teak coffee tables. In a second lounge/TV room, alcoves are filled with a museum-like display of antiques, while furnishings include a table with four easy chairs and a long wooden bar concealing the master controls for the audio system wired to all the living areas. Satellite TV and movies on the drop-down projection screen can be enjoyed from an enormous daybed. 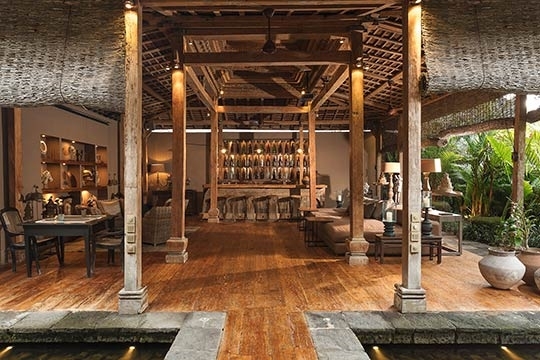 Adjoining the main lounge is the kitchen, with stone island/breakfast counter, wine fridge, plethora of appliances and shelves stocked with herbs and spices; the adjacent dining pavilion is dominated by a wood banquet table for 12. Giant copper lamps cast light, and a long upholstered sofa and cushioned benches provide seating. 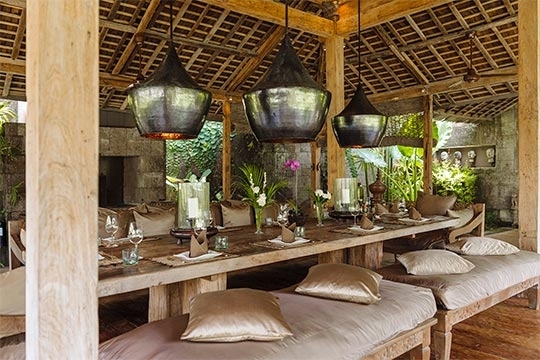 Tribal headpieces cover the sideboard and a wood-fired barbecue is built into a stone alcove. 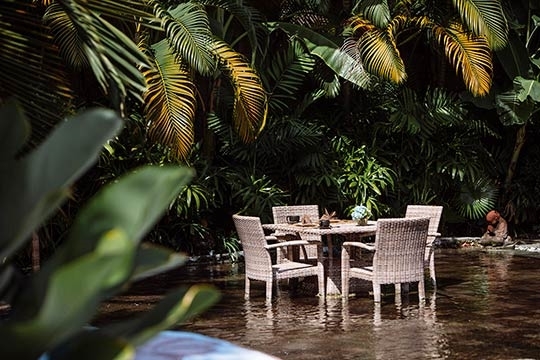 Carved wooden birds are draped from the ceiling of the sofa-filled pool pavilion, while the serene 20m pool is watched over by statues of monks bowed in prayer, and daybeds nestle in the foliage. 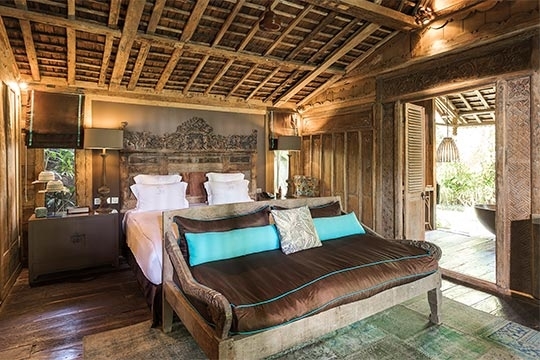 Private sleeping quarters are arranged around the garden, with a beautifully carved joglo housing the master suite and four air-conditioned gladak serving as guestrooms – each named after the predominant colour themes of their soft furnishings; Purple, Brown, Turquoise and Orange. All bedrooms are equipped with an iPod dock, king-size bed with customised linen, ceiling fan, antique occasional furniture and carved wall panels as elaborate headboards. Walk-in wardrobes include a bar fridge and safe. 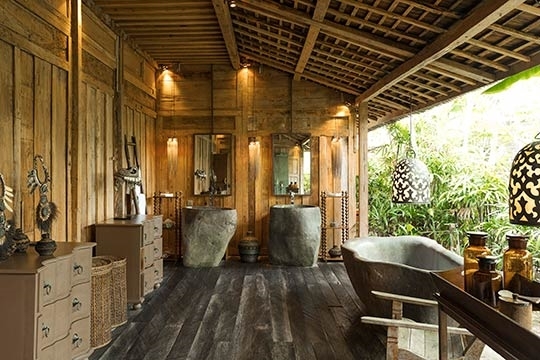 Distinctive semi-outdoor bathrooms, each with bathtub and private garden, highlight natural materials including stone and petrified wood. 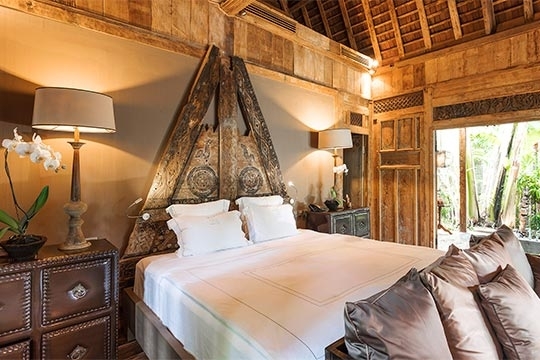 The extravagant master suite features a magnificent tiered wooden ceiling supported by ornamented pillars draped with golden fabric, and is equipped with a Satellite TV and DVD player. 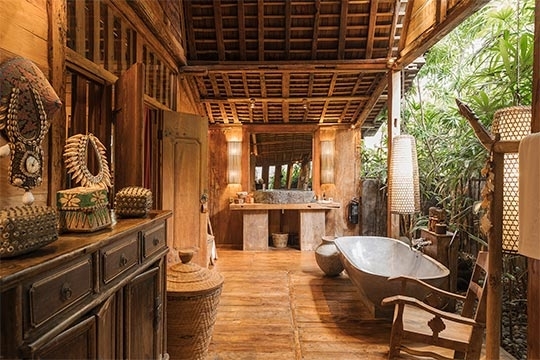 Two double-storey spa balés (pavilions) each have a pair of massage beds, one is adjoined by a semi-outdoor bathroom, while the other doubles as gatehouse leading to the neighbouring villa. Limited Time - USD $990++ per night until 20th June Stay anytime from now until 20th June 2019 at the special rate of USD $990++ per night. 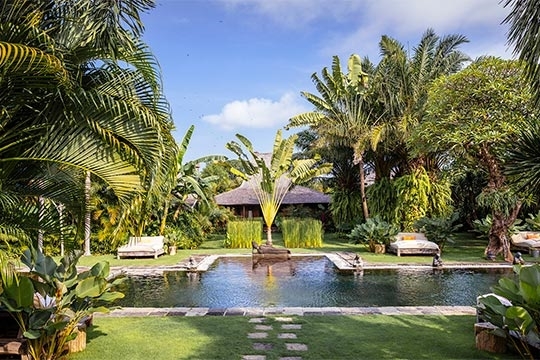 5 bedroom villa located in Canggu, Bali. Ideal for Beach in ten, Body and soul, Bring the relatives, Eco aware, Kid friendly, Going for golf, Fair share for groups, Party pads, Spa sensation, Perfect for weddings. 9 out of 10 based on 19 user reviews.